Saute the onions in butter with bay leaf (to be removed before pureeing) until onions are translucent. Add the chopped broccoli, water or stock and seasonings. Cook about 10 minutes covered until broccoli is tender, but still bright green. Puree little by little with milk in the blender. Make sure the mixture is absolutely smooth. Whisk in sour cream or yogurt. Heat gently and serve right away. Top with minced scallions. 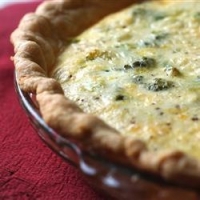 A variation from the "Moosewood" Cookbook. 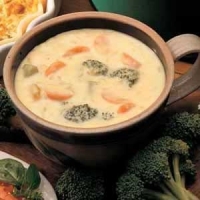 Recipe categories: Soups & stews, Bisques/cream soups, Broccoli.